Property prices in Cyprus fell by up to 9.6 per cent year-on-year during the third quarter of 2014, according to the twentieth publication of the RICS Cyprus Property Price Index, with falls continuing in many parts of the island. ACROSS Cyprus, residential property prices for both houses and apartments fell by 1.6% and 1.0% respectively during the third quarter of 2014, with the biggest drop being in Nicosia (3.4% for houses) and Limassol (1.5% for apartments). Values of retail properties fell by an average of 2.0% and those of offices by 1.4%, while those of warehouses remained stable, according to the twentieth publication of the quarterly RICS Cyprus Property Price Index. Compared to the third quarter of 2013, the average price of a residential apartment has fallen by 6.3% and the average price of a 3-bed semi has fallen by 4.4%. Retail property has fallen in value by 9.6%, offices by 6.3% and warehouses 4.2%. RICS Cyprus reported that due to the prevailing economic conditions and the turbulence in the Cyprus banking system, there was a lack of transactions during the quarter. Local buyers in particular were the most discerning as the increase in unemployment and the prospects of the local economy maintained the lack of interest. Furthermore, those interested were unable to access bank-finance or their deposits. The recession in the Cyprus property market is causing major problems for the banks and borrowers, many of whom are now in negative equity. Since the first RICS Cyprus Property Price Index was published for the first quarter of 2010 residential house values have fallen by an average of 29%, while those of apartments have fallen 39%. Rental values recorded a quarterly drop of 1.2% for apartments, 0.9% for houses, 3.2% for retail units, 0.4% for warehouses, and 0.9% for offices. Compared to the third quarter of 2013, rents dropped by 4.7% for apartments, 4.1% for houses, 11.2% for retail, 9.2% for warehouses and 4.6% for offices. At the end of third quarter of 2014 average gross yields stood at 3.9% for apartments, 1.9% for houses, 5.2% for retail, 4.3% for warehouses, and 4.4% for offices. The parallel reduction in capital values and rents is keeping investment yields relatively stable and at very low levels (compared to yields overseas). This suggests that there is still room for re-pricing of capital values to take place. RICS – the Royal Institution of Chartered Surveyors – is the largest organisation for professionals in property, land, construction and environmental assets, worldwide. The organisation was created in 1868 and now has over 140,000 members in 146 countries. RICS Europe is based in Brussels and represents 17 national associations, with over 8,150 members in Continental Europe. Visit www.joinricsineurope.eu and www.rics.org for more information. The Cyprus Association of Quantity Surveyors and Construction Economists (ΣΕΕΟΚΚ) is the association that represents Chartered Quantity Surveyors and Quantity Surveyors whose main area of work is in Cyprus and they permanently live in Cyprus. Visit www.seeokk.org for more information. The methodology underpinning the RICS Cyprus Property Price Index was developed by the University of Reading, UK. The report may be viewed by clicking here. The RICS Cyprus Property Price Index monitors the urban centres of Nicosia, Limassol, Larnaca, Paphos and Paralimni-Famagusta. The Index only tracks prices in Republic of Cyprus’ government controlled area and not in the occupied North. In each of these centres, the index monitors the Market Value and Market Rent, as defined in the RICS Red Book, across the four main property sectors – office (CBD), retail (high street), industrial (warehouse) and residential (houses and apartments). Recognising that there are sub-districts within these urban areas which operate and behave in a varying manner, a number of these is monitored in order to derive the composite index for each category per urban area. The information provided in this publication is based on the average price and rent of the sub-districts monitored per urban centre per sector. The complete list of these sub-districts can be found in the University of Reading’s report which may be viewed by clicking here. 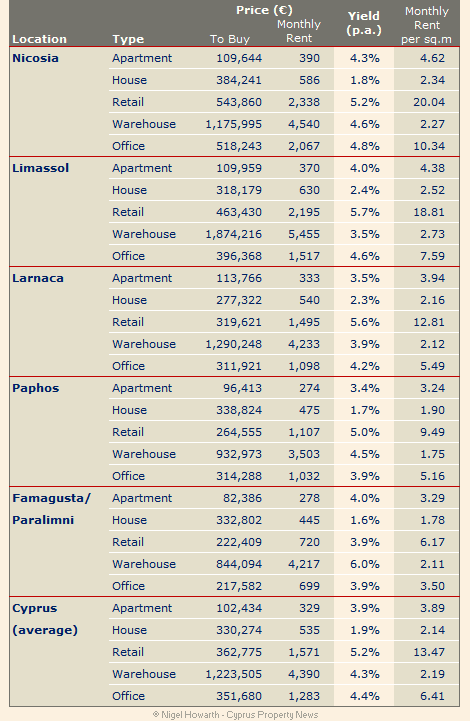 The RICS Cyprus Property Price Index monitors hypothetical or notional buildings, each having specific characteristics. Details of these hypothetical properties are provided in the University of Reading’s report. The provided price per sqm is based on the Gross External Area of the property (as defined in the RICS’ Code of Measurement Practice 6th Edition), which includes the living area and covered verandas but excludes common areas. Comments on this article are no longer being accepted. The value of my house makes little difference, unless I intend to sell, which I don’t. But it will be interesting to see if the IPT value will also go down or be more in 2015. IPT values stayed at 1980 values this year because so few people would be paying it, made it a punitive tax on the few who had to pay. There is no reason why over 70% of the properties on the Island, mostly occupies by GC in the villages should be exempt. They actually get to elect the Government so should actually pay for the mistakes of the leaders. It had to happen, prices will still continue to fall until realistic levels are reached. It may offend some but you didn’t need to be a genius to know that the bubble had to burst sometime. You no longer sit in the outdoor snack bar in Tala Square hearing “My house has just gone up umpteen thousands this month”. The views expressed in readers' comments are not necessarily shared by the Cyprus Property News.